Think about Foursquare right now. You can tell everyone what you’re currently doing, but there’s no good mechanism for planning something to do or for getting a recommendation for something to do. Sure, you could use “shouts” that way. But no one does. It’s an aspect of realtime that doesn’t really work. Enter Ditto, a new service in the space. 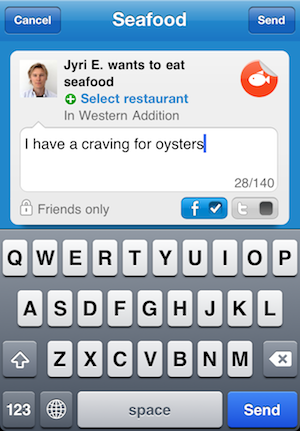 Ditto is an iPhone app in the location space that goes beyond the check-in. Sure, that’s one aspect of it, but if Ditto works as intended, it’s hopefully only the end result. “It is about sharing your intent to do something instead of what you’ve already done,” is how founder Jyri Engestrom puts it. If you recognize Engestrom’s name, it’s because he was a co-founder of Jaiku, one of the early micro-messaging services that sold to Google in 2007. After two years there using parts of Jaiku to build Profiles, Buzz, and Latitude, Engestrom left Google seeking to “make meaning” once again. After dabbling in some angel investing, Ditto is Engestrom’s attempt to do just that. When you first load up Ditto, you’re asked to log in via Facebook Connect. With that social layer out of the way, you’ll see a main screen with three swipe-able pages of big icons along the top. Things like “At home”, “Eat out”, “Work”, and “See movie” all easily allow you to declare you intention to do something. Clicking on any of these drills down to a box where you can comment on your plans and also set a specific location for that plan. But that’s one of the keys. If you don’t know where you should eat for example, you just leave the location blank. It will then send a message to your Ditto friends that you want to eat, but aren’t sure where. When your friends see this, they can leave a comment recommending spots to eat. And if you like one of them, you can award them a trophy. Or if you want to do the same thing, there’s a “ditto” button — hence, the name. This works basically the same way for all of the various activities, not just eating. And you can be even more specific about your intentions by choosing other icons beyond the general food one. For example, there’s an “Asian” icon, a “Breakfast” icon, etc. And again, if you already are doing something, you can say that as well — much more of a traditional check-in. And you can even push those to Foursquare (and Twitter and Facebook). But it’s not just about location. “The same basic use case applies equally to a broad range of social objects, including Netflix movies, books, music, etc. — all now consumable on the device! 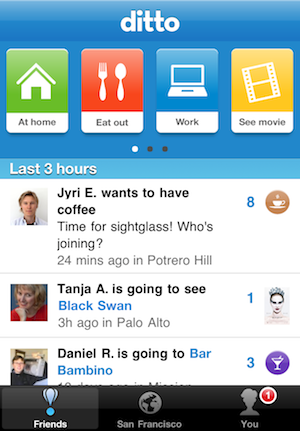 We’ll be adding new activities dynamically to the app over the next months,” Engestrom says. “Discovery is going social, social is going mobile, and nailing it is a huge, Google-sized opportunity that could replace traditional search on the phone. Ditto’s beauty is in that it naturally captures you at the moment when you make a decision, and combines algorithmic results with real time recs from your social graph,” he continues. There are already whispers out there that Foursquare itself is about to push more heavily into the recommendation game soon. And obviously, you could use Twitter or Foursquare for these things. So why use Ditto? Engestrom believes they’ve nailed an important intersection of features that the others can’t match because they already have set users with expectations. “It is simpler than Facebook, more fun that Twitter, and more useful than Foursquare,” is his succinct way of putting it. And I have to agree. I’ve been using the app for about a week now, and it is a nice combination of checking-in, social interaction, and recommendations. And the latter will only improve with the app now open to all. Yet another app that could be perfect for SXSW. We previously covered the funding of Ditto parent Pingpin last year. You can find Ditto in the App Store here.